It’s a terrible truth that in 2018, many women still struggle for equal treatment in the workplace and equal respect in the C-suite. Recruiter.com: Corporate leadership has long been a boys’ club, and tangible change to the makeup of the C-suite has only begun in recent years. What barriers have traditionally stood between women and corporate leadership? What skills are crucial to overcoming these barriers? Conflict Between Their Commitments to Work and Home: Many women express that they feel guilty when they are focusing on their families for fear that they will be judged at work, and that they feel guilty when they are focusing on their jobs because they are not paying attention to something they could be attending to at work. I personally experienced this struggle recently when both my adult son and elderly father were in the midst of major health crises at the same time. I wondered if I should cut short a business trip in order to be with my family members who needed me. There was no real business need for me to stay out of town, as I am able to fulfill most of the requirements of my job at home. But if I returned home, there was a chance that my physical absence could have been negatively perceived by my boss or peers. Cultural Stereotypes That Produce Prejudice and Discrimination: Long-entrenched cultural norms are difficult to break. Oftentimes, the biases that aspiring women leaders face are unconscious biases. Strong leadership traits have been defined primarily by men. While a man who speaks directly may be considered “assertive,” a woman who speaks in the same manner may be labeled “bossy.” When a man expresses drive for success, he is often seen as “ambitious,” while a woman with the same aspirations may be judged as “ruthless.” Interestingly, the hierarchical, transactional style of leadership that depends upon rewards and punishments to drive employee behavior has been proven to be less effective in today’s business climate. This can be seen as less effective than a more inclusive, transformational style of leadership that engages employees and relies more on intrinsic motivation to deliver results. Caliper’s research shows that women tend to exhibit that desired, transformational leadership potential to a greater degree than men. As a result, both women and organizations are being held back by these old stereotypes. Organizational Norms, Structures, Policies, and Procedures That Fit Men’s Lives Far Better Than Women’s Lives: The formal and informal ways of making decisions, communicating information, and getting things done have primarily been defined by men. Whether intentionally or not, those norms can often leave women standing on the sidelines or having to work twice as hard in order to achieve the same recognition at work. A woman I recently coached, who lives in a small town, tells the story of having a lunch meeting with one of her male clients to review a large purchase order. The next day, she received an emotional phone call from the man’s wife, accusing the woman of having an affair with her husband. Another woman I know discovered after she was promoted to vice president that the big decisions at her company were not made in a conference room, but on the golf course. When confronted, her male counterparts admitted that it didn’t cross their minds to invite her to join them because it never crossed their minds that she might play golf. When she assured them that she does play, enjoys playing, and is a pretty good golfer, she was told that perhaps she could substitute whenever one of the other men had a conflict. It is not easy to change these long-held traditions, but by calling attention to them, suggesting alternatives, and continuously speaking up, they can be changed. RC: What advice can you give to women professionals about breaking out of the mold? Should they be shrugging off these stereotypes and certain expected behaviors? CS: I don’t think that “shrugging them off” is the answer. Determination to be part of the change seems a more appropriate, powerful response. 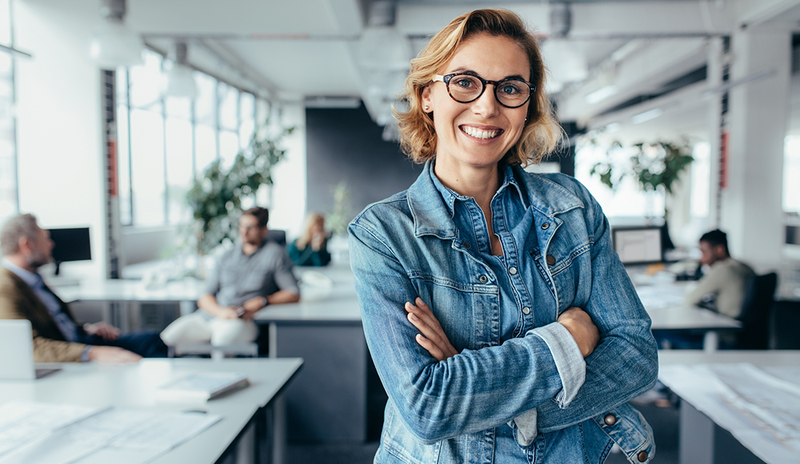 Successful women leaders have found ways to accept that it is not simply what happens to them, but how they respond to those events that has the greatest impact on their success. It requires a strong drive to take on new challenges and overcome the barriers that have been presented, refusing to be victimized and willing to make things happen. Responding favorably requires that a woman professional accurately assess and understand what has happened. With that objective, fact-based understanding, she can then envision a number of coping strategies and possible responses. With flexibility, she can choose the alternative that will bring her the results she desires. Each woman’s leadership journey will be unique and characterized, in part, by her unique combination of innate behavioral tendencies that will impact her natural responses. Increasing her self-awareness by understanding her personality strengths and opportunities for development will be the important first step toward developing compensating mechanisms. Some of the skills that will be most important to develop include “finding her voice” by balancing empathy with a straightforward, assertive style of communication. Learning to say what she means and mean what she says will allow her to build followership by building a reputation as an authentic, believable, trustworthy, and consistent leader. Being willing to take some calculated risks and break some of the spoken or unspoken rules or stereotypes that can hold her back will begin to break down the stereotypical expectations that she and other women encounter. Regardless of the challenges that she faces, building her resiliency is one of the most impactful developmental activities that any woman can take. It requires strong emotional intelligence, learning how to control her impulses, and regulating her emotions. That does not mean that she should stop feeling, but that she learn to acknowledge her feelings; redirect her thoughts; and make a conscious decision about how she chooses to show up, reach out, and respond to those challenges. RC: How can female leaders connect with other likeminded women professionals in the workplace and outside of their own organizations? Coaching: Working with a professional coach can help a woman reflect on her situation, identify stressors and challenges, develop coping strategies, and experiment with new skills. The coaching relationship is a powerful partnership that allows the client to set the agenda, priorities, and goals and to explore options in a safe, confidential, supportive environment. Mentoring: Intentionally look for female leaders who model the kind of behavior you would like to emulate. Reach out to them and invite them into a conversation with you about their leadership journey. Many will be honored that you’ve asked and may be interested in exploring a mentoring relationship with you. I’ve yet to meet a successful female leader who doesn’t have a heartfelt desire to support aspiring female leaders along their journeys. Networking: Many larger organizations have diversity councils, a woman’s network, or mentoring programs designed to support women in the workplace. If your organization does not currently have one, consider starting one! There are also many networking groups and associations around the country that support professional women. These groups provide a valuable forum for sharing stories and resources, learning new skills, developing mentoring relationships, and networking. Today more than ever, this topic is garnering significant attention, and one need only do a quick search online to find a plethora of resources.